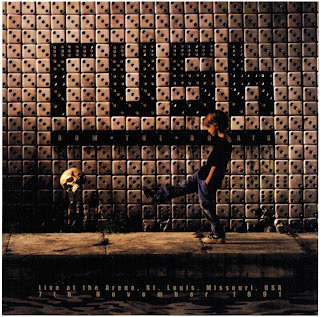 This is Rush live on the 7th November 1991 at The Arena, St. Louis, MO, USA from a bootleg double CD titled 'Row the Boats', which is linked to the Roll The Bones tour. Rush have been together since 1968 with a consistent band line up since 1974. More than 40 years of activity has provided Rush with the opportunity for musical diversity across their discography. As with many bands known for experimentation, changes have inevitably resulted in dissent among critics and fans. The bulk of the band's music has always included synthetic instruments in some form or another, and this is a great source of contention in the Rush camp, especially the band's heavy reliance on synthesizers and keyboards during the 1980s, particularly on albums Grace Under Pressure, Power Windows, and Hold Your Fire.